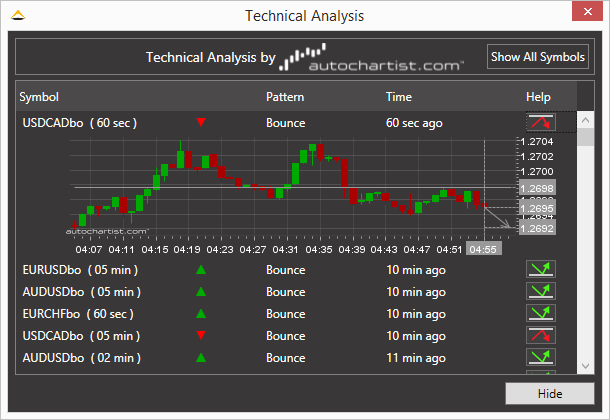 TradeToolsFX (TTFX) announced that they have partnered with Autochartist to provide trading alerts for binary options traders. According to terms of the deal, Autochartist’s technical trading alerts are being integrated within TTFX’s MetaTrader 4 binary options trading offering which they provide to brokers. Alerts are available for 1, 2 and 5 minute intervals, with the goal of the offering to provide brokers consistent content to engage their binary options trading customers. A provider of financial technology to forex and binary options brokers, among products that TTFX has been aiming to carve a niche in the market is with its binary option platform that integrates with MetaTrader 4. As such, the current partnership with Autochartist provides another feature for brokers using their MT4 binary options solution. For Autochartist, the deal marks the continuation of their business range beyond their core forex technical analysis offering. Earlier this year they partnered with SeerTrading to make available an Autochartist created strategy for SeerHub. In addition, like the current deal with TTFX, they have become more involved with the binary options industry, having integrated their analysis for Tradologic and Binary Station.